Desktop 3D printers have become cheaper and cheaper, which has made the technology accessible for prototyping and manufacturing for companies, hobbyists, universities, schools and other makers. Many of these users will use their affordable printer in office settings, on personal working desks and even in their bedrooms. Most users are not aware of the health risks that are introduced when a production machine is installed in a non-industrial environment with poor ventilation. So the development in desktop 3D printing is going fast, but unfortunately, the development of the knowledge and implementation of 3D printing safety is lagging behind. In this blog post, we will delve into the scientific literature on 3D printing health risks and we will propose solutions to improve your 3D printing safety. All fused deposition modeling (FDM) 3D printers are emitting ultrafine particles. These particles are defined as particles with a diameter less than 0.1 µm. You cannot see them, but you might already have encountered them. Ever had a headache or irritated eyes or skin when working with or near 3D printers?If so, this may have been caused by UFPs. These small-sized particles are hazardous to human health since they are capable of penetrating through our lungs and into the bloodstream. UFPs are related to hospital emissions for stroke and asthma symptoms . Little research is done on the pollution of FDM desktop 3D printers. However, there is some research that elaborates on the type of pollution and the potential health risks. A representative 3D printing setup is evaluated in . This setup contains multiple 3D printers in a furnished and ventilated office space that is used for 3D printer education, training and sales for the public. Ultra-fine particle sizes and concentrations are measured at a 2m distance from the closest desktop printer. First, a background measurement in which no 3D printer is running is executed. Then, a 25 min print with 2 PLA printers is done. The PLA is printed at a nozzle temperature of 200 degrees Celsius. After this period the printers are turned off before starting the third measurement in which 2 PLA and 3 ABS printers operate. Finally, the printers are turned off to measure the decline in UFP particle concentration over time. Figure 1 shows the result of their measurements. Interpreting these results can be difficult if you are not an expert in the field. To make this a little more intuitive, let’s compare these values with other, more common situations. In the paper, the emmission of one 3D printer using PLA feedstock is (1.9-2.0 x 1010 # min-1). In terms of UFP pollution,this is roughly similar to continuously cooking with an electric frying pan (1.1e2.7 x 1010 # min-1) without any ventilation. 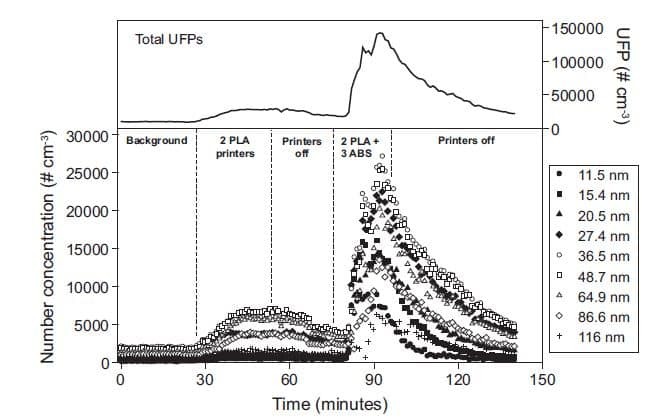 Davis et al  quantify the UFP emission from operational 3D printers with the use of a special developed environmental chamber. Multiple materials and 3D printer brands are tested. 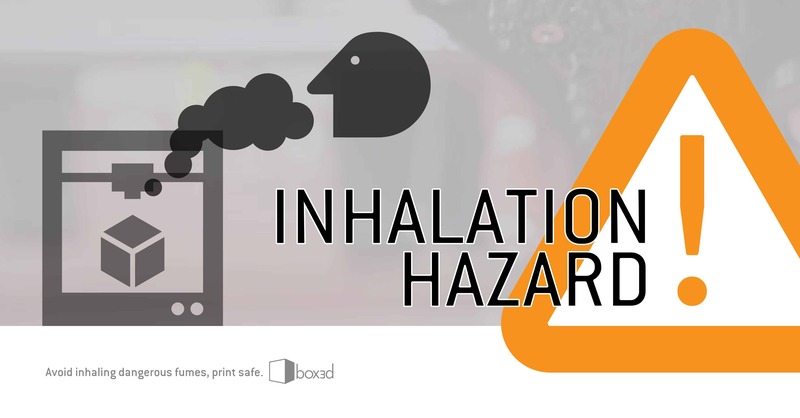 The authors conclude that FDM 3D printing with ABS exceeds safety standards set by the Office of Environmental Health Hazard Assessment (OEHHA), (acetaldehyde inhalation reference exposure level(REL) over 0.47mg/m3) and the World Health Organization (formaldehyde level over 0.1 ppm). Furthermore, they recommend that the toxicity of UFPs from 3D printers should be studied and regulations and standards are needed to increase 3D printer safety. The same 3D printer using ABS feedstock emits (1.8e2.0 11 # min-1) , which is similar to grilling food on gas or electric stoves at low power input (1.2e2.9 x 1011 # min-1). The 3D printers that are experimentally measured in this research can all be classified as “high emitters” with UFP emission rates greater than 1010 particles per min, according to criteria set by . The chemicals that are released during the heating of thermoplastic materials are known or suspected irritants and carcinogens, therefore exposure to 3D printer emissions should be minimized. Stephens et al. refer to multiple sources that discuss the effect of UFPs on human health. It can, for example, increase the hospital admissions for stroke or it can cause asthma symptoms. Not all the risks of UFPs are well known yet and are still under study. Any addition to the UFP aerosols should be undertaken only after serious consideration Click To Tweet. Two specific 3D printer types, the Da vinci XYZ and Makerbot Replicator 2X, are subjected to a test in . Transmission electron microscopy (TEM) and energy dispersive analysis of X-rays (EDAX) are used to identify the volatile organic compounds that are released during printing with these machines. VOCs are chemicals with a high vapor pressure at room temperature. This will make them easy to evaporate in the air. The difficulty of these VOCs is that they are not acutely toxic, which means that possible health effects will only become apparent after a longer period of time. This means that investigating these effects is difficult: VOC concentrations are usually low and the symptoms related to the exposure of VOCs develop slowly. Both PLA and ABS emission are measured by an exposure assessment . Microscopy and chemical analysis are used to identify the particles that are released. Printing PLA releases particles of titanium (figure 2). 3D printing with ABS emits cyclohexane, n-decane, ethylene propylene-diene terpolymer, 1-decanol, and isocyanic acid. Figure 2: Volatile Organic Compounds in PLA, Source . Improve your 3D printing safety by creating underpressure around the FDM printer, which will fumes out of the work environment. Zontek et al  demonstrated the importance of a 3D printer enclosure with proper airflow to reduce particle concentrations. Using the lower end of the suggested print temperature of the material used. Use PLA filaments, which have lower UFP emissions. Consumers are not aware of the health risks that are connected to a desktop 3D printer. Development of desktop 3D printing is going fast, but the development of 3D printing safety is lagging. Recent research shows that desktop 3D printers are high emitters of UFPs and VOCs, which are associated with serious health risks Currently,there are limited official safety standards and guidelines for the usage and installation of desktop 3D printers, which means that health risks are often not taken into account in current setups Therefore, the safest and most viable option for using a 3D printer is to direct the particles away from the users by harnessing airflow and underpressure. 1. Stephens, B., Azimi, P., El Orch, Z., & Ramos, T. (2013). Ultrafine particle emissions from desktop 3D printers. Atmospheric Environment, 79, 334-339. 2. Zontek, T. L., Ogle, B. R., Jankovic, J. T., & Hollenbeck, S. M. (2017). An exposure assessment of desktop 3D printing. Journal of Chemical Health and Safety, 24(2), 15-25. 3. Davis, A., Black, M., Zhang, Q., Wong, J. P., & Weber, R. (2016). Fine Particulate and Chemical Emissions from Desktop 3D Printers, 24(2), 15-25. 4. He, C., L. Morawska, and L. Taplin (2007), Particle emission characteristics of office printers. Environmental Science and Technology, vol. 41(7), pp. 6039-6045.